TUSCALOOSA, Ala. — The University of Alabama School of Law announced today a $26.5 million donation from prominent business executive and attorney Hugh F. Culverhouse Jr. The donation was announced today in a campus ceremony and includes a $1.5 million gift Culverhouse made in 2017 to establish the Hugh F. Culverhouse Jr. Endowed Chair in Constitutional Law, which serves as a foundation for a program in constitutional studies. The gift will establish the Hugh F. Culverhouse Jr. School of Law Endowment for Excellence and will enable the law school to develop innovative programming, expand its physical presence, increase scholarship support for students, provide additional educational and career opportunities for students and support a 21st century law library, said Dr. Mark E. Brandon, dean of UA’s School of Law. “I am ever grateful for Mr. Culverhouse’s friendship with the School of Law and grateful that he has seen fit to invest in our future,” Brandon said. 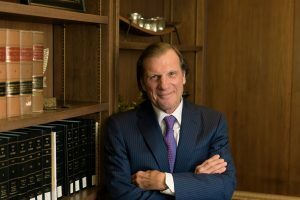 Known for his philanthropic efforts, including his longtime support of UA and his creative approach of issuing challenge gifts, Culverhouse has, along with his wife, Eliza, now cumulatively committed more than $35 million to UA over the past decade. Starting in 2015, Mr. Culverhouse donated $250,000 to endow a women’s golf scholarship in honor of his mother, Joy McCann Culverhouse, who starred as a UA golfer in the early 1940s. In total, the couple has contributed approximately $2.25 million to endow women’s golf scholarships at UA. In 2012, the Culverhouses donated $1 million to UA to establish the Hugh F. and Eliza Culverhouse Scholarship to support high-achieving students with financial need. Since then, they have contributed an additional $5.3 million to the UA Culverhouse College of Business, which is named after Culverhouse’s father, Hugh Culverhouse Sr.
Hugh Culverhouse also contributed $147,000 to Athletics in 2000 to fund an endowment named in honor of former football player Derrick Thomas for student scholarships. A Coral Gables, Florida, resident, Culverhouse is the chief executive officer and owner of Palmer Ranch Holdings, a planned community encompassing some 10,000 acres in Sarasota County. He is also the principal in Culverhouse Limited Partnerships and invests in real estate, securities and hedge funds. Culverhouse earned a Bachelor of Science from the University of Florida in 1971, an MBA in corporate finance from New York University in 1972, and a law degree from the University of Florida law school in 1974, the same year he became a CPA in Florida. He began his legal career in 1975, serving as a trial attorney for the United States Securities and Exchange Commission’s Division of Enforcement and then as the Assistant U.S. Attorney for the United States Department of Justice. He served in private law practice in Florida from 1979 to 1999. He has been admitted to the U.S. Supreme Court, the 5th and 11th Circuit Court, and the Florida Bar. One of America’s leading public law schools and consistently ranked as one of the best values in legal education, the Hugh F. Culverhouse Jr. School of Law at The University of Alabama offers a challenging curriculum with over 150 electives, several dual enrollment opportunities, Master of Laws degrees, and a J.S.D. With a student-to-faculty ratio of 6.3:1, the law school offers students a rigorous, hands-on learning experience, with strong student engagement in clinical programs, legal journals, moot court teams and trial advocacy.